"I feel like I have received warm regards from my Holocaust victim grandparents whom I never knew," says Miriam Hanina. "I feel like I received warm regards from my Holocaust victim grandparents whom I never knew," says Miriam Hanina, nee Tafelkruijer. The regards came in the form of two mezuzahs her grandparents hid in a wall in their Amsterdam home during the Holocaust, and which were found during the course of refurbishing work several years ago. The woman who currently lives in the house took the time and trouble to track down the original owners, leading to a "reunion" with their granddaughter Miriam who now lives in Even Shmuel, near Be'er Sheva. "I never knew anything about my grandparents or about my aunt," Miriam told Israel National News, "because my father, the only survivor of his family, refused to talk about anything having to do with that period. Now, all of a sudden, I feel that I have received a 'hello' from them." Both Miriam and the house's current owner, Suzanne Rodrigues-Pereira, are descendants of Anusim (known in the past as Marannos) who arrived in Amsterdam from Portugal around the late 15th century. In the course of routine refurbishing work inside the house several years ago, Suzanne found two mezuzah scrolls – small parchments with Torah passages that, in accordance with Biblical law, are affixed to the doorposts of Jewish homes – wrapped one inside the other, close to the place where one should have been affixed. She immediately realized that this was a significant find, and set out to find who had put them there. Miriam herself was born in 1945, after her father Meir, a member of the Dutch underground, was hidden together with his wife and son in the home of a Righteous Gentile Dutch doctor. Miriam, who made Aliyah to Israel on her own in 1967, said that her grandparents' home was emptied of its Jews during the Holocaust, and a Gentile family was placed there instead. It was through a member of this Gentile family that Suzanne was able to locate Miriam – the daughter of the man who inherited the house from his Holocaust victim parents who hid the mezuzahs. The Tafelkruijer family living there for years prior to the Holocaust was religiously observant, Miriam recounts, and therefore the only explanation for the deviations from Jewish Law - two scrolls in one, wrong placement - is that they were forced to hide the mezuzahs. "They had to make sure the Nazis and their Dutch accomplices, of whom there were not a few, would not see them," she said. 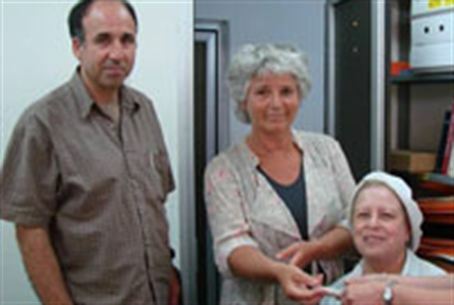 Suzanne arrived recently in Israel to hand-deliver the mezuzahs to Miriam, who showed them to her husband – a former ritual scribe – to check their status. Amazingly, he found that one of them, the larger of the two, was still kosher, and Miriam has decided to return it to its place in her father's home. The other one did not withstand the ravages of time, at least in terms of its kashrut, and Miriam donated it – together with a collection of Holocaust-era documents from the Jewish community in Amsterdam that her father amassed – to the Holocaust Museum in Kibbutz Lochamei HaGetaot. Miriam noted that her unique maiden name, which apparently means Table-porter, will live on in future generations only in the merit of this story of the found mezuzot, as no male children with that name have been born into her family. This coming summer, Miriam and her daughter will visit Amsterdam, where an official "mezuzah-restoring" ceremony will be held. In addition, Miriam said, "there was an old shack behind the house, used for a Sukkah during the Holocaust… I have bought another mezuzah that I will affix there as well." Yet another result of this story is that Suzanne and her neighbors have researched the former Jewish owners of many of the buildings on their street. She has established an Internet site that provides many long-lost details, including information on family members and relatives who lived there.